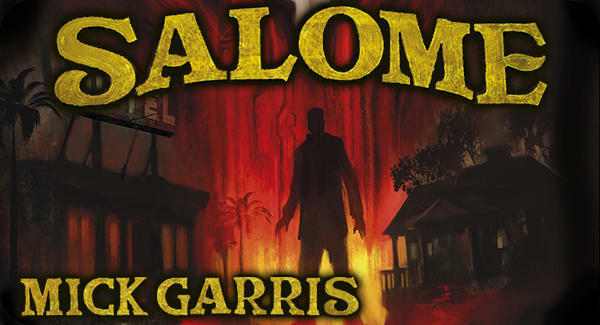 The first line of the new novel, Salome, by Mick Garris, is “I thought I hated my wife, until she was murdered.” When any novel begins with powerhouse line like that, you know to grab your britches and hang on because the journey’s going to be a whirlwind of a ride. This is the story of a young Hollywood actress, Chase Willoughby, who was a star on television at the age of twelve. She grew into a beautiful woman, but the phones stopped ringing once the tv series eventually ended. One night around three in the morning, her husband of two years, James Turrentine, receives a telephone call from a sheriff in Arizona, stating that Chase has been found murdered, sliced apart by a maniac with a knife. James immediately gets dressed, hops in his Beamer, drives to Salome, Arizona where the morgue wagon is just getting ready to load the body of his wife into its rear compartment. Though James and his wife had reached a point where they seldom talked to each other and really didn’t care for one another, he makes a silent promise to track down the killer and get revenge. This is the crux of Salome–a simple revenge story that has a profound effect on one’s psyche because it seems so close to reality. 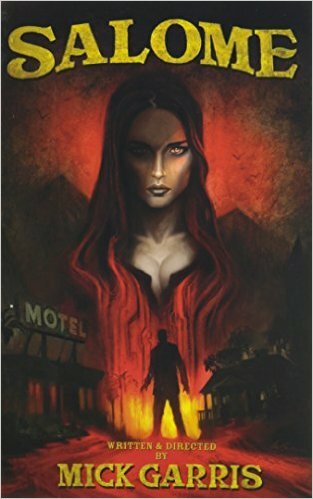 As James starts his search for the killer, the reader also begins to learn about Chase Willoughby and how she eventually ended up in that small bit of wasteland known as Salome, Arizona with her body slashed to pieces. The place does exist, and it sounds like somewhere you don’t want to have your car break down in. I should also point out that the reading audience gets a much clearer view of the Los Angeles area and what it’s like to be a star with both the good and bad being exposed. You walk away from this novel with opened eyes that have seen the light, learning how dangerous strangers can be to celebrities. The author, Mick Garris, comes from a film industry background and knows what he’s talking about. There is no glitz and glitter in this novel. It simply portrays the ugly facts for what they are. It’s up to the reader to either believe, or to continue seeing La-la Land through rose-tinted glasses. Another thing Mr. Garris is able to do is weave a story to its final conclusion like a true wordsmith. He has an innate ability to draw the reader into his world with a few choice words that are as good as any hook I’ve ever encountered. He doesn’t bore you with needless information, but rather chooses each and every word for its ability to move the story forward. This man is a writer in every sense of the word, and a brilliant one at that. In fact, some of his sentences are so beautifully written that you may find yourself reading them out loud just to have the words roll off of your tongue in admiration of his writing skills. My only wish is that Mick Garris wrote on a more frequent basis. He’s that good! I’ve heard through the grapevine that the author does have another book due for publication, but its several months down the line. I guess I’ll just have to settle for Stephen King and Dean Koontz until the next book by Mick Garris finally comes out. Highly Recommended!